Do you have what it takes to run as a team, represent your province for a chance to win P3 million cash? Laban ng Lahi 2018 is inviting 33 runners from your province or town to run as one and compete with different regions all over the country. 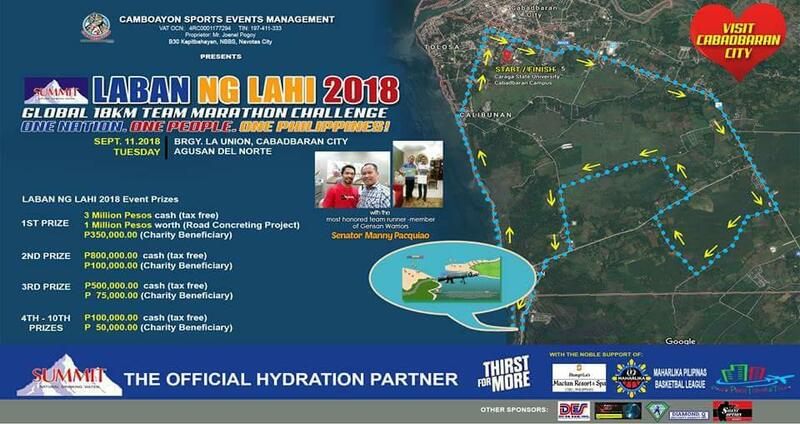 A global and unique 18-km team marathon challenge, Laban ng Lahi 2018 is a tourism-for-a-cause and peace revolution advocacy project with the goal of achieving national reconciliation set on September 11 in Brgy. La Union, Cabadbaran City, Agusan Del Norte. The competition is a race challenge format where criteria of judging include shortest time (65 percent), team presentability (tailor-made uniform or body painting uniform) (13 percent), chanting (5 percent), team work (9 percent), and team support (8 percent). The team should compose of one team manager, one assistant manager/team dietitian/therapist, and 30-31 actual members. A local team must have at least three female runners. Maximum of 10 foreigners (if there are any), otherwise the team will become a foreign team. For foreign team, it must have at least two foreign female runners and one Philippine passport holder female runner. It must have at least three Philippine passport holder runners (two males and one female). Registration fee for local team is P2,000 per person or member or P66,000 per team; for foreign team, P3,000 per member or P99,000 per team. Deadline of registration is on August 31. Each team must have Team Banner and Guidon for recognition and they must be prepared by the organizers. They will be fitted to a weighted loaded stick. Once the Team Banner and Guidon are folded, destroyed, or lowered below head level automatically disqualifies the team. Laban ng Lahi 2018 is the brainchild of Joenel Pogoy, founder and president of Camboayan Sports Event Management and a member of Philippine Military Academy Class of 1999. Pogoy, who is a native of La Union, Cabadbaran City, Agusan Del Norte, conceptualized the event as a way of uniting the country through sports and promote it globally. “My inspiration is faith in God, who gave me the wisdom,” said Pogoy, who also revealed some challenges he encountered while organizing the event, including people who did not believe in his advocacy. First launched last March 2017, the event did not push through supposedly on September that year because the original financiers abandoned the project, taking with them the first advertisement cash sponsorship worth P1 million. “I have no choice but to postpone the finals event but I continued the qualifying leg in Tanjay, Negros Oriental for the purpose of actually introducing the competition concept. Secondly, I cannot just retract my commitment to the Mayor of Tanjay City regarding this qualifying leg project because it was already included in their calendar of activities during their month-long fiesta celebration,” Pogoy said. Eventually, his persistence paid off and re-launched the project again this year and got the support of no less than Boxing champ and Senator Emmanuel “Manny” Pacquiao, who will be coming to Cabadbaran City as a team runner-member of Saranggani Gladiators Platoon. Apart from Pacquiao, Fifth District of Pangasinan Rep. Amado T. Espino, Baguio City Mayor Mauricio G. Domogan, Zarraga, Iloilo Mayor John Tarrosa, ABAKADA and ABS Partylist also expressed their support by endorsing the event and hosting the qualifying legs. “I am enjoining all local government leaders as well as the Filipino communities all over the country and around the world to send competitive teams from your respective area,” said Pacquiao in a statement. The event is sponsored by Summit Drinking Water, Maharlika Pilipinas Basketball League (MPBL), Du Ek Sam (DES) Inc., SM City Cebu, Shangri-la Mactan Resort & Spa, Wellcome Hotel Cebu, Quest Hotel, Silent Option Security, Podium Boutique Hotel Baguio, Ebays Coffee Shop, Nardas, Palcer Place Travel & Tours, Asianskymall, Asian Massage, Kyusoku Bihaku, Ikumou Hair Grower Shampoo, Diamond Q Security Agency, Yellow Kids Talent Center, and Flexgear Philippines. For more information, visit the website or Like its Facebook page: Laban Ng Lahi 2018.